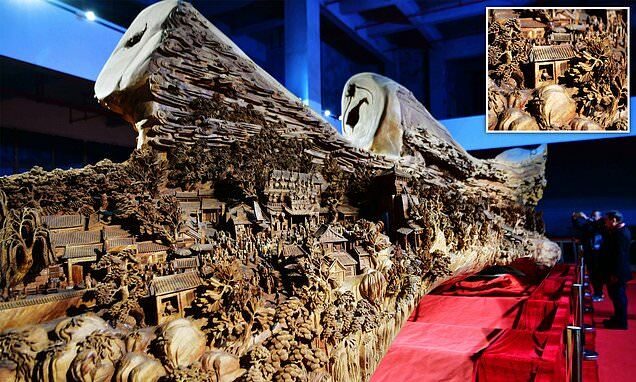 One of China's most famous paintings has been brought to life in a stunning 40 foot-long wooden carving. 'Along the River During the Qingming Festival', perhaps the best-known scroll painting in Chinese art history, was meticulously engraved on the trunk of a thousand-year-old camphor tree by sculptor Zheng Chunhui. Images of the impressive 30-tonne display at a museum in Putian, south-east China's Fujian province were released by Xinhua news agency on Thursday. The classic panoramic painting - dubbed 'China's Mona Lisa' - by imperial artist Zhang Zeduan depicts a flourishing urban life in Bianjing, the capital of the Northern Song Dynasty (960-1127). Bianjing is today's Kaifeng city in Henan province.